Does banking have to be boring? Banking at its heart is incredibly boring. Let’s face it, adding figures on one ledger and subtracting from another is a mind numbingly dull task for the best of us. Just take your own monthly budget. While the credits are rather nice to see fattening up your bank account on pay day, how many of us (excluding accountants) assiduously track the slow bleed of money to utility providers, unused gym memberships, student loan repayments and exorbitant train fares on a daily or even weekly basis? And what about business owners? Do they enjoy spending time on things like EFTPOS, payroll, BAS, loan repayments and overdrafts? As far as I know, no one decides to open a business to do those things first, and sell their products second. They’re a necessary evil, a means to an end – something we put up with because we don’t know any better, or can’t afford to pay someone to do them for us. But while the very act of banking, reconciling and moving money from A to B is probably destined to be boring no matter who you do it with, is it possible for us to ease some of the pain by at least going through the motions with a brand we love? Is there room in our hearts for a fintech equivalent of the likes of RedBull, Virgin, or T- Mobile? 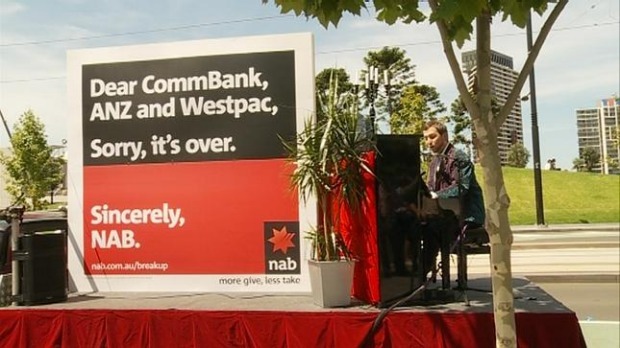 NAB certainly thought so back in 2011 when it decided to ‘break up’ with the other major Australian banks, launching a guerilla marketing campaign that involved break up cakes delivered to competitor bank executives, buskers singing break up ballads and cheeky twitter feeds looking for love advice. And while the concept is a little hard to swallow for your average banking cynic, it certainly deserves top marks for ingenuity and cut through. Who doesn’t want to partner up with the bank that’s prepared to ‘stick it’ to all the others? Better still, it kept the CEO happy. Putting aside the less tangible PR benefits, NAB’s campaign generated a 79% increase in home loan enquiries, a 50% increase in credit card applications and a 20% increase in new transaction accounts opened, week on week. Not bad for a little creative thinking, don’t you think? Of course, breaking up is never easy. And sometimes we go crawling back to that bad relationship. NAB’s campaign shortly fell by the wayside and the bank got back to doing what it does best – safe and boring. Which, really, makes excellent business sense when you have their balance sheet. Why put your neck out on the line when you don’t need to? Yet in a world slowly filling up with multiple online payment platforms, a myriad of peer to peer lenders and a mountain of banking apps that do this-that-and-everything-else, fintech startups can’t afford to be as complacent. They need to be as courageous and creative as NAB were for a fleeting moment, yet sustain it. Being prepared to stand out from the crowd is scary for a lot of us, especially in business. There’s a chance people won’t like what we do, it’s a vulnerable place to be, if we get it wrong we’ll lose face. In fact, being prepared to be ‘not liked’ by everyone is not just a simple risk you accept when you decide to go against the status quo. Being ‘not liked’ is a hard nosed reality for the truly creative brands and individuals. The difference is, if creative campaigns are executed correctly for brands, a solid proportion of people will love you, incredibly unconditionally. And that is worth far more than sitting in the middle of the pack of averages. As humans we don’t want our lives or our brands to be grey. We want them to be black and white, to align with what we do or don’t believe in, to capture our hearts. Time and time again we back the ones that deliver us experiences, they make us laugh, cry, feel inspired or believe life can be better. Why should banking or fintech be any different? Courage and creativity are the building blocks of many a fintech startup’s DNA. But somehow for many, that is seemingly forgotten about when they bring their product to market. Instead of relying on a product to ‘sell itself’, fintech brands need to be thinking about the experience that sits around their product. And unless a banking product powered by technology can give me the same feeling as sitting behind the steering wheel of a Porsche can, this is a reality fintech founders need to think long and hard about if they want to stand out from the pack and last the distance. The race is on, and I strongly believe the ones who dare, will win.